What else can I expect from an online Master's in Sports Management program? Sports management is a broad interdisciplinary field that covers the different aspects of athletic organizations, including finances and budgeting, marketing, human resources, and facilities management. A bachelor's degree is considered the minimum educational requirement for most careers in sports management. For this reason, students who earn an online master's in sports management are highly valued as job candidates and stand to advance in their careers more quickly than those with less academic experience. Students who earn a master's degree in sports management typically enjoy higher salaries and lower unemployment rates than those with just a bachelor's degree. Students who wish to obtain an advanced degree in sports management usually choose from one of two options: a Master's in Sports Management, or a Master of Business Administration with a sports management concentration. The best online sports management master's programs emphasize the importance of law, ethics, and professional conduct in the athletic industry. Students who enroll in these programs are often able to earn a degree specialization in areas like sports marketing, athletic training, and sports leadership; these concentrations are designed to prepare students for careers in niche areas of sports management. Many sports management programs culminate in a master's thesis or capstone project that allow students to demonstrate the knowledge and skills they have gained through their master's-level coursework. Other programs require students to gain supervised hands-on training through an internship and/or practicum course. Learn more about what you stand to gain from pursuing a sports management master's degree online and what kind of career opportunities you can look forward to with this comprehensive guide. WHAT CAN I DO WITH A SPORTS MANAGEMENT MASTER'S DEGREE? Graduates with a master's in sports management are prepared for many positions, including athletic director, assistant athletic director, and facilities manager. Read more here..
IS A MASTER'S DEGREE IN SPORTS MANAGEMENT WORTH IT? Professionals with a master's degree have higher median earnings than those with a bachelor's. And a master's in sports management allows professionals in the field to obtain higher earning potential. Read more here..
HOW DO I GET A MASTER'S DEGREE IN SPORTS MANAGEMENT? After gaining admittance, students must complete all curriculum requirements, which may include an internship or capstone project. Curriculum requirements vary between programs, so for more accurate informations, students should contact their prospective schools. Read more here..
WHY GET A MASTER'S IN SPORTS MANAGEMENT? By earning a master's in sports management, graduates are able to obtain higher earning potential. The degree also prepares them for higher-paying, sports-related positions. Read more here..
WHERE CAN YOU WORK WITH A MASTER'S IN SPORTS MANAGEMENT? Graduates of sports management master's programs are prepared for administrative, education, and coaching and scout positions. Read more here..
WILL AN ONLINE MASTER'S IN SPORTS MANAGEMENT PROGRAM PROVIDE ME WITH THE SKILLS I NEED TO ADVANCE MY CAREER? The best online master's in sports management programs prepare students to enter the workforce after graduation and obtain top-level positions with varied employers. The curriculum will introduce students to the industry's latest tools and technological platforms. Depending on their specialization, students may be required to complete courses or course sequences in areas like marketing, analytics, and/or theories of management. Graduates leave school with a deeper understanding of their role as leaders in the sports management field, with highly developed communication skills, a complete understanding of the inner-workings of athletic organizations, essential administrative skills, and real-world experience. WILL AN ONLINE MASTER'S IN SPORTS MANAGEMENT WORK WITH MY SCHEDULE? Online sports management master's programs offer a flexible alternative to traditional classroom learning. Students are able to access course lectures and readings, turn in written assignments, take exams and contact their professors any time of day. The latest educational technology also enables them to study on the go using a laptop, tablet, smartphone or other device with Wi-Fi compatibility. For added convenience, students are usually allowed to fulfill their internship or practicum requirements at a site close to their home. WHAT JOBS CAN I GET WITH MY MASTER'S IN SPORTS MANAGEMENT? Graduates who earn a sports management master's degree online leave school prepared for most entry-level roles in the industry, as well as some managerial positions normally reserved for candidates who have an advanced degree. They commonly find work in places like college athletic departments, the front offices of athletic organizations, and major sporting goods retailers. Graduates with a specialization in marketing or public relations often go on to work with athletes as agents or business managers. WHAT ARE THE BEST ONLINE MASTER'S IN SPORTS MANAGEMENT PROGRAMS? Choosing a program is an incredibly personal decision, and only you can properly evaluate whether a target school's strengths match your educational needs. The following ranked list of schools should serve as a helpful starting point in your search for the best online master's of sports management programs in the United States. If you are considering pursuing an online sports management master's degree, be sure to contact admissions specialists at different colleges and universities to learn more their about specific requirements and offerings. Located in Gainesville, Florida and initially founded in 1853, the University of Florida is a public research institution that brings a range of academic programs to the north central Florida region. UF's online master's degree in sport management is an excellent option for aspiring sports professionals. This 36-credit online sports management master's program offers a variety of advanced specializations including athlete development, sport law, and high performance coaching. Admission requires an undergraduate degree from an accredited college or university with a minimum cumulative 3.0 GPA, proof of experience in the sports industry, and recent GRE or GMAT scores. Applicants must also provide a brief statement of purpose that outlines both long- and short-term professional goals and overall fitness for the program. Once enrolled, degree seekers can expect a broad but intensive curriculum that lays a foundation for career paths including finance, marketing, event coordination, and coaching. The school uses an intuitive online instruction format featuring discussion boards, chat rooms, and occasionally instant messaging. UF holds regional accreditation from the Southern Association of Colleges and Schools. Georgetown University was first established in 1789 by Jesuit settlers along the banks of the Potomac River in historic Washington, D.C. Now a private research institution, Georgetown offers an attractive online master's in sports industry management. As one of the top online sports management master's programs, it emphasizes networking opportunities and career mentoring, making it ideal for people pursuing a career in the highly competitive sports industry. Georgetown's degree consists of 30 credits delivered in a convenient, customizable format that helps students balance their education with other commitments. Classes cover a variety of foundational skills, highlighting topics like sports marketing and media, applied industry ethics, sports business and finance, and global business acumen. The degree culminates with a capstone project conducted under the guidance of one of Georgetown's expert faculty members; this project often doubles as a springboard for future careers. Applicants must hold a bachelor's degree from an accredited institution and submit official transcripts for all previous academic work. Other requirements include a current resume, a brief statement of purpose, two letters of recommendation, and a modest application fee. Georgetown holds regional accreditation from the Middle States Association of Colleges and Schools. Founded in Evanston, Illinois in 1851 by a group of local businessmen, Northwestern University is a large, regionally accredited private research institution. Located minutes from downtown Chicago, Northwestern boasts over 124 undergraduate degrees and nearly 150 graduate and professional programs. Among these is Northwestern's master's in sports administration, which prepares students to begin or advance careers in the sports industry. This 11-course online program involves six core course modules, three electives, a required leadership course, and a thesis or capstone project. It offers a range of flexible concentrations, including a distinctive sports analytics specialization -- offered only online -- that prepares students for work in an increasingly data-driven industry. Other topics include sports research methods, sport-specific public relations, front office operations, and sports sales strategies. This sports management master's degree online program delivers content in a flexible, hybrid format at a flat per-course tuition rate that learners can pay as they go. Courses can be taken completely online, on campus, or both, and students typically finish in 2-3 years. Interested applicants must submit official transcripts from an accredited undergraduate degree, a statement of purpose, a relevant writing sample, and at least two recommendation letters. Northwestern holds accreditation from the Higher Learning Commission. Founded in 1898 and located just steps away from historic Fenway Park in Boston's Back Bay neighborhood, Northeastern University is a major private research school. Home to over 25,000 graduate and undergraduate students, Northeastern provides career-focused programming through a variety of professional degrees, including a master of sports leadership. Housed within Northeastern's Global Network, this online sports management master's program takes 1-2 years and offers mostly online instruction with a mandatory week-long summer intensive on its Boston campus. Learners can select from two concentrations -- professional sports administration or collegiate athletics administration -- while engaging with topics like fiscal practices in sports, corporate sponsorships, sports law, ethical leadership, and sports media relations. The school forgoes standardized exams in its admissions process, requiring only bachelor's transcripts, a resume, a brief statement of purpose, and two letters of recommendation. Northeastern is accredited by the New England Association of Schools and Colleges and its top online sports management master's program holds accreditation from the Commission on Sport Management Accreditation. First established in 1871 in south central Texas, Texas A&M University boasts the largest student body in the state and the second largest in the United States. TAMU was the Lone Star State's first public institution for higher education and it currently offers over 150 academic programs, including its MS in sport management, which is ideal for learners pursuing careers as administrators, decision-makers, or managers in the sports industry. This two-year, 36-credit top online sports management master's program focuses on managerial administration: Sport marketing and sales, fiscal and personnel management, and athletics administration. Graduates find professional opportunities in industry-related outlets like country clubs, health and fitness clubs, collegiate athletic departments, and professional sports organizations. Students in the online sports management master's program can choose full-time or part-time schedules depending on their needs, and admissions requires official transcripts, a resume, a brief statement of purpose, and three letters of recommendation. This program does not require the GRE, but recent exam scores can enhance an application. TAMU holds regional accreditation from the Southern Association of Colleges and Schools. Mississippi College is a small, private Baptist college located in Clinton, Mississippi on the outskirts of the greater Jackson metropolitan area. Founded in 1826, MC is the second-oldest Baptist-affiliated higher education institution in the United States and the oldest university in Mississippi. MC provides education and professional training to just over 5,000 students across 80 academic programs, including its online sports management master's degree, the MS in athletic administration. This 37-credit, two-year program provides students with the skills and resources necessary to build a career in athletic administration at a college or secondary educational institution. Students attend classes through a Moodle course management system and supplement coursework with two six-week practicums, which include a minimum of 60 hours of onsite work. MC uses a simplified admissions and transfer process. Applicants need only submit official copies of relevant academic transcripts, standardized test scores, and a modest application fee. MC is regionally accredited by the Southern Association of Colleges and Schools. The University of Texas at Austin was founded by the Texas state legislature in 1883. Located just north of the Colorado River, UTA is a major hub for academic research in the Lone Star State. It offers nearly 300 degrees, including an online sport management master's program. The 36-credit program offers all the same benefits as UTA's traditional programs, but with added convenience and flexibility. This online sports management master's degree delivers all course content digitally, focusing on resource management, business and marketing, ethics, law, and leadership, and most students finish in two years. Interested degree seekers must submit a current resume, official academic transcripts from a bachelor's degree program, two letters of recommendation, a brief statement of purpose, and recent GRE scores. UTA holds regional accreditation from the Southern Association of Colleges and Schools. Located in the nation's capital, just steps away from the National Cathedral, American University is a private research institution first chartered by the U.S. Congress in 1893. AU serves nearly 15,000 learners each year across a variety of undergraduate degrees, graduate courses, and professional programs. Among these is AU's online master of science in sports analytics and management, which explores the complex nexus between sports, business, and data analysis. The two-year program consists of 30 credits and covers subjects like sports analytics and social engagement, strategic sports management, new technologies, and data-driven decision making. This top online sports management master's program delivers all course content electronically through a cohort model that gives degree seekers an opportunity to share ideas, connect, and collaborate with their peers. Learners interested in applying to AU's online sports management master's program must submit a resume, official academic transcripts, a statement of purpose, and letters of recommendation. The university accepts up to six transfer credits from accredited outside institutions and graduate schools. AU is regionally accredited by the Middle States Association of Colleges and Schools. Formerly known as Christ College, Concordia University-Irvine is a private Christian university first established in 1976 by the Lutheran Church-Missouri Synod. Located in sunny Orange County, California, CUI offers more than 70 academic programs, including a master's in coaching and athletics administration for degree seekers looking to start or advance a career in athletics. This online sports management master's program consists of 36 credits with a variety of elective options. Once enrolled, learners can expect classes in principles of coaching and leadership, sport medicine and performance, exercise physiology and biomechanics, athletic finance, and advanced strength, speed, and conditioning. Core skills obtained through this program help degree seekers find careers in coaching and athletics administration. The program offers several delivery styles, including online, traditional onsite classrooms, and hybrid options. CUI holds regional accreditation from the Western Association of Schools and Colleges and uses a rolling admissions process. Applicants must possess a bachelor's degree from an accredited institution with a minimum 2.75 cumulative GPA. GRE scores and letters of recommendation are not required. Since its founding in 1887 by a Jesuit priest, Gonzaga University has provided learners with a variety of academic and professional programs. Currently situated along the banks of the Spokane River in eastern Washington State, GU offers a compelling master's in sport and athletic administration degree for aspiring professionals interested in sports and collegiate athletics. This online sports management master's program spans 31 credits, and most students finish in two years. The program delivers all coursework completely online, including 10 classes and one internship. Once admitted to the program, degree seekers can expect to study topics like sport and athletic promotions, research methods and statistics in athletics, sport media and communication, and legal issues in sports. Admissions to GU's sports management master's degree online program are highly competitive. In lieu of a statement of purpose, applicants must submit a short video clip of five minutes or less that speaks to their professional goals and fitness for the GU program. Other requirements include letters of recommendation, official academic transcripts, a current resume, and answers to a short admissions questionnaire. GU is regionally accredited by the Northwest Commission on Colleges and Universities. Liberty University is a private Christian university located along the foothills of the Blue Ridge Mountains in Lynchburg, Virginia. Liberty provides academic programming for over 100,000 learners each year. Founded in 1971 by evangelical ministers, Liberty is the largest private nonprofit university in the United States, and it offers an MS in sports management. The 36-credit online sports management master's program, sponsored by Liberty's School of Education, focuses on social issues in sports management, sports marketing and outreach, economic and financial aspects of the industry, and recreation. All course content can be completed online through eight-week course modules, and most students finish in two years. There is no thesis or capstone requirement. Liberty holds regional accreditation from the Southern Association of Colleges and Schools, and its sports management master's degree has programmatic accreditation from the Commission on Sports Management Accreditation. Admission applications require a bachelor's degree with a minimum 3.0 cumulative GPA. Liberty offers benefits and financial aid for current, discharged, or retired members of the military. Located in the San Joaquin Valley region of California, Fresno Pacific University was founded in 1944 by the Pacific Conference of Mennonite Brethren Churches. Today, it is a private Christian university that serves students across 100 degree specialties, including a master of arts in sport administration tailored specifically for degree seekers interested in building a career in sports management at the secondary, collegiate, and professional levels. FPU's online sports management master's program provides educational training for both working professionals and students with no experience in the field. The 30-credit program offers all courses fully online, allowing students to balance work and life requirements with their educations. Learners can expect to study topics like kinesiology research methods, sports revenue and finance, leadership and administration, and career development strategies. FPU is regionally accredited by the Western Association of Schools and Colleges and requires applicants to submit a statement of intent and one letter of recommendation. Degree seekers must also submit official transcripts for all college-level studies and have a minimum 2.75 cumulative GPA. From its 72-acre campus in Buffalo, New York, Canisius College offers learners an 11-to-1 student-faculty ratio and an average class size of 17. The Jesuit institution provides more than 180 undergraduate and graduate programs to over 3,700 learners each year. Online programs at Canisius College include a master of science in sports administration that emphasizes trends, communication, and technology in the sport industry. The online master's in sports administration at Canisius comprises 36 credit hours. Required classes include leadership in sport, strategic sport marketing, sport communication, and sport finance and business. Learners also study intercollegiate athletics, moral and ethical aspects of sport, and elective coursework in sport facility management and rule compliance for intercollegiate athletics. An internship in sports administration gives students the opportunity to conduct a faculty-guided research project while integrating degree content into the workplace. Students can complete Canisius's online master's in sports administration program in as few as 12 months. Learners develop competencies applicable to current careers in sports business, to leadership positions in sports organizations, and to new endeavors in coaching and event management. The program builds professionalism and leadership among sports management students while growing student awareness of the diversity, social policy, and philosophical issues related to sports. To apply, learners submit a formal application, a professional statement, two letters of recommendation, a resume, and transcript information from any bachelor's degree coursework. Canisius University maintains accreditation through the Middle States Commission on Higher Education. Founded in 1863 as an agricultural college, UMass Amherst currently sits on 1,450 acres in western Massachusetts, a short distance from both Boston and New York City. UMass Amherst's more than 30,500 students enroll in undergraduate, graduate, and professional programs offered through 12 schools and colleges. UMass Amherst's Isenberg School of Management offers an online master of business administration with six specializations, including sports management. The online MBA in sports management includes 45 credit hours of general and concentration coursework. Learners complete core classes in the foundations of accounting and finance, business law, data analytics and statistical methods, and operations management. Students with previous coursework in accounting and finance may receive exemption from foundational classes. Additional required courses in organizational strategy, corporate finance, and economic analysis for managers prepare learners to take on leadership roles within business settings. Nine credit hours of sports management classes further build managerial and leadership competencies applicable to the sport industry. Students choose from classes like sports analytics, applied sport market research, and consumer sales strategies in sport contexts. Before applying for the online MBA at UMass Amherst, learners can take two classes within the curriculum. Applicants to UMass Amherst's online MBA in sports management submit a graduate school application, transcript information, a personal essay, letters of recommendation, and GMAT scores. Admitted students can defer acceptance to the program for up to one year. UMass Amherst holds accreditation from the New England Commission of Higher Education, and the Isenberg School of Management maintains accreditation through the Association to Advance Collegiate Schools of Business. Accredited by the Southern Association of Colleges and Schools Commission on Colleges, Virginia Commonwealth University embraces its origins as a medical college founded in 1838. The merger with Richmond Professional Institute in 1968 informed VCU's current mission, name, and values. Based in Richmond, Virginia, VCU provides more than 200 academic programs to over 31,000 undergraduate and graduate students. VCU's School of Business, accredited through the Association to Advance Collegiate Schools of Business, and the Center for Sport Leadership offer an online master of sports leadership degree to professionals seeking to enter managerial and leadership roles. Interdisciplinary coursework provides students with the knowledge and skills applicable to working with professional and amateur athletes; managing private or public sports programs; and developing interpersonal, financial, and professional skills for sport business. The 36-credit curriculum includes required courses in research methods in sport, sociology of sport, sport business, sport law, leadership models in sport, and marketing of sport. Students complete 18 credit hours in elective classes that integrate field experiences and advanced research skills. Learners must complete an externship in a sport setting and pass a comprehensive exam to earn their degree. Applicants to VCU's online master of sport leadership must hold a bachelor's degree in an appropriate discipline and submit three letters of recommendation, a written statement of career interests, a resume, and transcript information. Learners should also submit GRE or GMAT scores for consideration. Online students apply for one of three admission dates and must complete one on-campus course before obtaining their degree. Wayne State University in Detroit, Michigan, provides academic programs to more than 27,000 students through 13 schools and colleges. The public institution, founded in 1868, holds distinction as Michigan's third-largest university and maintains accreditation through the Higher Learning Commission. WSU's College of Education offers an online master of arts in sports administration and management to sport industry professionals looking to advance their careers. Students interested in sports business also gain knowledge and skills applicable to working in professional, collegiate, amateur, interscholastic, and recreational sports settings. The online master's in sports administration and management comprises 30 credit hours, including an internship or master's thesis. Required courses in sports administration, sport finance, risk management in physical education and sport, and equity and access in sport provide foundational competencies. Elective classes allow students to further tailor their degree. Options in interscholastic athletic direction, collegiate athletic administration, principles of coaching, and sports event management give students access to advanced content related to personal and professional goals. Students who complete an internship in sports administration work within an approved sport or leisure setting to observe, assess, and gain hands-on experience. An additional field work elective course gives learners the opportunity to participate in a practical experience. Thesis students complete six credit hours in research and writing under the supervision of a faculty member. Requirements for admission include a bachelor's degree with a minimum 2.5 GPA. Learners must submit official transcripts, a current resume, a one-page personal and professional statement, and a formal graduate application for consideration. Concordia University-Saint Paul offers more than 80 academic programs to undergraduate and graduate students, including almost 50 online degrees. Founded in 1893 in Saint Paul, Minnesota, CSP stays true to its Lutheran Church-Missouri Synod origins by blending Christian values and academic excellence. As one of the eight schools within the University of Concordia System, CSP holds accreditation through the Higher Learning Commission. CSP's online master of arts in sports management prepares learners to take on management and leadership roles in their current sports-related career or to enter a new position within the sports industry. Students gain decision-making, critical thinking, and analytical skills through 33 credit hours of specialized coursework. Learners study business fundamentals -- such as organizational leadership, human resource management, and managerial finance -- while taking classes in sport marketing, legal aspects of sport, and ethics and policy in sport management. Learners also complete a research design methods course to gain qualitative and quantitative research skills applicable to organizational sports settings. CSP's online sports management master's degree includes a capstone course to blend content with practical experience in the sport management industry. Students can study abroad and gain experience in an international environment. Learners complete the online sports management master's degree in just over 18 months. Applicants to the program submit a formal application, transcript information, and a personal statement detailing professional and personal history as it relates to graduate study. For consideration, applicants need an accredited bachelor's degree with a minimum cumulative 3.0 GPA. Founded in 1884, Temple University currently provides academic programs to more than 35,000 students from its main Philadelphia, Pennsylvania, campus, regional campuses, and international locations in Rome and Tokyo. Temple's 17 schools and colleges offer more than 500 undergraduate and graduate programs, including an online executive master of science in sports business degree. Mid- and senior-level sport industry professionals with at least five years in the field complete the executive master in sports business degree in 13-15 months. Offered through Temple's School of Sport, Tourism, and Hospitality Management, the 30-credit degree incorporates coursework from the Fox School of Business. Students choose three business courses in human resources, global business, financial analysis, and marketing. Sport industry courses include sport finance and economics, consumer behavior in sport and recreation, sport analytics, and sport media and communication. Through a cohort model that begins each fall, learners complete three five-week courses each semester. Temple's online executive master's in sports management builds student and instructor interaction through live weekly online sessions and project-based learning activities. Applicants to Temple's online executive master's in sports management submit an application, an application fee, official transcripts, GRE or GMAT scores, and two letters of recommendation. Additional application materials include a statement of goals and a current resume. Learners with sufficient academic or professional history may receive a GRE or GMAT waiver. Temple holds accreditation through the Middle States Commission on Higher Education. As one of the six schools within the Arkansas State University System, A-State offers academic programs from its main campus in Jonesboro, Arkansas, and at degree centers across the state. Founded in 1901, the former agricultural school now provides undergraduate and graduate learners with on-campus and online degrees in more than 140 fields. A-State's online programs include a 36-credit master of science in sport administration. Learners can complete the program in 12 months. Classes in sport marketing, sport law, sport leadership, and sport finance and budgeting build business and legal competencies related to sports. Coursework in ethical issues in sport and sport in society courses provide insights into broader aspects of sport theory and practice. Students complete a research design class to develop and refine research skills and participate in a reading seminar to assess contemporary issues and trends in sport science and physical education. The six-credit internship spans two seven-week terms, allowing students to demonstrate degree competencies in an approved organizational setting. Learners must submit an online application with accompanying transcript information, a statement of goals, a resume, and two letters of recommendation for entrance to A-State's online master of sport administration program. Students need a bachelor's or master's degree with a minimum cumulative 3.0 GPA or a 3.25 GPA from the last 60 credit hours. Applicants with lower GPAs may receive conditional admission. A-State maintains accreditation from the Higher Learning Commission. A-State's master of science in sport administration program holds accreditation through the Commission on Sport Management Accreditation. Located in Dayton, Tennessee, Bryan College grew out of the Scopes Trial of 1925 to promote higher education with a Christian worldview. Named to honor William Jennings Bryan, the institution received charter in 1930. Bryan College infuses its evangelical, nondenominational heritage into more than 50 undergraduate and graduate programs, including its online master of business administration degree. Accredited by the International Assembly for Collegiate Business Education, Bryan College's online master of business administration degree offers five specializations, including an MBA in sports management. The online MBA in sports management builds on a traditional MBA curriculum in management, leadership, economics, and accounting -- with advanced coursework related directly to sports organizations and settings. Students complete classes in sport finance, sport marketing, and sport facility and event management to gain deeper insights and interactions in the field. All classes incorporate a Christian perspective. Courses in Bryan College's online MBA in sports management last nine weeks, allowing students to complete the 36-credit curriculum in as few as 14 months. Bryan College offers flat-fee tuition rates and financial aid. Applicants to Bryan College submit an online application, fee, and undergraduate transcripts for admission. After applying, students discuss the program with an admissions counselor who contacts them directly. Bryan College maintains accreditation through the Southern Association of Colleges and Schools Commission on College. Bryan College also boasts memberships with the Tennessee Independent College and University Association, the Association of Christian Schools International, and the Appalachian College Association. As one of the largest private universities in the U.S., Drexel University offers more than 200 undergraduate and graduate programs from three Philadelphia, Pennsylvania, campuses, regional sites throughout the state, and online. More than 4,500 of Drexel's 24,000 students study online, including learners in the school's online master of science in sports management. Drexel University's online sports management master's degree meets the needs of current sport industry and management professionals by building advanced competencies in the field. Students who want to enter sports administration and other sports-related professionals also gain knowledge and skills to design, evaluate, and implement sports programs. The 45-credit online master's in sports management includes 33 credits of required courses and 12 elective credits. Students complete business and sport business core classes in financial performance, sport industry management, sports economics, leadership in sport management negotiations, and sport media and technology. Elective classes in areas like sports ticket sales and strategies, NCAA compliance, and sport tourism allow learners to further specialize the curriculum to meet personal and professional goals. Learners also complete a sport industry practicum project or research thesis. Part-time students complete the online sports management master's degree in as few as three years. Applicants must hold a bachelor's degree from a regionally accredited institution with a minimum 3.0 GPA. Application materials should include a formal application, official transcripts, two letters of recommendation, and a personal and professional essay. Applicants submit a current resume with at least two years of experience in the field. Established in 1868 as a teaching college, SUNY Cortland joined the State University of New York system in 1948. SUNY Cortland's main campus encompasses more than 190 acres in Cortland, New York, providing undergraduate and graduate programs in over 100 disciplines. Accredited by the Middle States Association of Colleges and Secondary Schools, SUNY Cortland offers two master of science degrees in sports management, including a 30-credit online general sports management program. 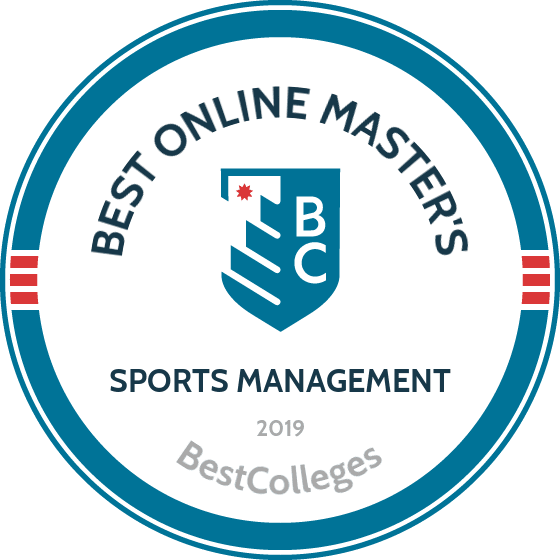 The online master's in sports management prepares learners for careers in collegiate and professional sport, national sports organizations and governing bodies, and sports marketing or management firms. Students complete 24 credit hours of coursework online, a six-credit internship, and a master's project or thesis. The degree spans five terms, or roughly two calendar years. Learners take classes in sport enterprise, business and finance of sport, sport marketing, policy and strategic management in sport organizations, and sport law. Coursework in research methods precedes a thesis in sports management, while an internship gives students the opportunity to work within a sports organization, business, or related setting. Students choose their own internship sites for faculty approval. Applicants to SUNY Cortland's online sports management master's degree should hold a bachelor's degree from an accredited institution with a minimum 2.8 GPA. Lower GPAs receive consideration with accompanying standardized test scores, a personal statement, letters of recommendation, and industry experience. Learners with a GPA above 3.3 from previous coursework, or five years of experience in the field, may receive a GRE or GMAT waiver. With 95 undergraduate and graduate programs, Jacksonville State University offers nearly 8,500 academic programs through six schools based at its main campus in Jacksonville, Alabama. JSU also offers degrees from its Little River Canyon Center campus, McClellan Center campus, and online. JSU provides more than 40 online programs, including an online master of science in sport management. JSU's online sports management master's degree prepares learners for careers in athletic organization management, event and facility management, sports marketing and advertising, athlete and talent development, and coaching. Current sports professionals or individuals looking to enter the sport industry complete between 30-34 credits in the business aspects of sport, including finance, marketing, promotion, and media relations. Classes in current issues and trends in athletics, sport ethics and law, and administration of athletics build student knowledge of the contemporary nature of the field. Learners complete 1-2 internships in sport management or a class in special education. The program offers an additional teacher certification option to students, with a bachelor's-level teaching certificate in any area of education or a higher degree and requisite teacher certification. Admission to the certification concentration requires at least two full years of professional work experience. Online students pay a flat-fee tuition rate. Applicants to JSU's online master's in sports management must submit a formal application, a non-refundable fee, official transcripts, three reference forms, and GMAT or GRE scores. Students with teaching credentials supply documentation of renewable teaching certificates. As the flagship institution of the West Virginia University System, WVU in Morgantown, West Virginia, houses 14 colleges and schools, offering degrees in more than 360 academic disciplines. Founded as a public, land-grant institution in 1867, WVU maintains accreditation through the Higher Learning Commission. The online master of science in sport management at WVU includes two degree tracks: comprehensive sport industry management and interscholastic athletic administration. Both programs allow current sport industry professionals to develop their knowledge and skills in the field. Individuals who want to enter sports management and administration also gain competencies to work in various subsets of sport. WVU's online master's in sports management includes 30 credit hours of coursework to build practical skills, research techniques, and leadership competencies. Core classes in the online master's in sports management program emphasize business technology, sport management strategy, and problem solving in sport. Learners who pursue the comprehensive sport industry management concentration focus on all sectors of the sport industry, from youth and collegiate athletics to professional and corporate sports. The comprehensive curriculum also includes a year-long field research project. The interscholastic athletic administration focus builds knowledge of athletic direction, facility management, and sports management at the middle and high school levels. Students complete coursework to earn the certified athletic administration certification from the National Voice for Interscholastic Athletic Administrators. Students enter the comprehensive sports management program during the summer term, while interscholastic athletic administration students begin at any time during the year. Applicants submit transcript information from an undergraduate program, documenting a minimum 2.75 GPA, a current resume, and a statement of professional goals. All online students pay in-state tuition for the master's in sports management program. Located in Greeley (about an hour north of Denver), UNC is a public college that’s home to an online master of science in sport and exercise science with a sport administration emphasis. Exploring general business skills along with specialized industry knowledge, the program prepares students to assume leadership positions in collegiate, commercial, professional, and Olympic athletic organizations. This accelerated degree is available fully online and can be completed in 12 months of full-time study. UNC counts sport management alumni among all the major U.S. athletic organizations, including the NBA, NFL, MLB, and NHL. This online master's in sports management requires 21 credits of emphasis courses and nine credits of electives. The program core consists of seven courses that focus on fundamental industry topics, such as management ethics, promotion and marketing, facilities and equipment management, and public relations. Electives allow students to specialize their degree with directed studies in related topics. Common elective courses include financial management for sports organizations, event development and management, and sport and higher education. Degree candidates interested in topics not covered by electives can also perform their own self-directed independent study (worth up to four credits) in an approved subject area. A sports and exercise science internship can also fulfill up to six elective credits, allowing students to gain supervised experience in a professional setting. UNC offers both thesis and non-thesis options, with the thesis fulfilling six elective credits. The thesis track requires candidates to complete a comprehensive research project that includes extensive data collection and analysis. Students complete thesis work under the supervision of an advisor, who must first approve their research topic. The non-thesis track requires candidates to complete a comprehensive examination that consists of a literature review and an analysis paper, both focused on major topics from the sports administration curriculum. Robin Monsky is a veteran sports industry PR/communications executive living in Chicago, Illinois. Since opening Round Robin Sports in 1996, her clients have included marquee names, like ESPN and LaLiga, and niche brands, like the Rugby Weekend and the Laureus Sport For Good Foundation. Monsky has worked at six Super Bowls, five Chicago Marathons, four World Series, three Sundance Film Festivals, one Davis Cup final, several regional NCAA basketball tournaments, and the 1996 Olympic Games, where she was press chief at Atlanta's Centennial Olympic Park when the bomb went off! Why did you choose to earn a degree in sports administration? Was this a field that always interested you? I wasn't always interested in a sports ad degree for one simple reason: I didn't realize it existed. Graduate school was always in the plan for me as a follow-up to earning my BA in economics but, until the summer before my junior year in college, I figured I'd choose between law school or getting an MBA. Then, fortuitously, I met someone who was a rising senior and was anxiously awaiting word on whether he had been accepted into the Ohio University sports administration master's program. I had never heard of that degree before but it immediately seemed like an exciting option. Ohio's program was the very first in the country (launched in 1967) and was only about ten years old at that point. I believe there were only two or three other schools that had adopted the idea since O.U. 's debut, so the concept of furthering my education while also working in sports was a game changer for the direction I was headed. While not a great athlete, I loved sports — had been the first woman sports editor of the oldest high school newspaper in the state of Nebraska. Grew up in a family of rabid Cornhusker fans — traveling to bowl games each winter. Wrote about sports for the college newspaper and also got a job as a student athletic trainer working with the athletes. I was the first woman student trainer at the school to be asked to work at football training camp and to consistently travel with the men's teams. My inclination to work in sports predated my knowledge that I could pursue the degree — but prepared me for it once I discovered it. By the way, the guy who told me about the program never got in, but I did! And here I am, 40 years later, still working in sports! What was the job search like after completing your degree? Did you feel fully prepared when transitioning from school to the workplace? Transitioning from student life to real life was fairly seamless for me upon graduation, in large part because of how the program was constructed then. I graduated in 1979, when one of the requirements for earning the sports ad degree was to complete a PAID internship in sports after wrapping up the coursework, and O.U. at that point had a growing and influential list of alumni very eager to give the new students an opportunity. The fact that a host organization had to pay you meant that you would be given a higher level of responsibility off the bat. It also fostered a confidence that what you had learned at school had created more value in what you had to offer a potential employer. The simple act of mandating that the internship be paid not only allowed students to ease out of the protective cocoon of being in an academic setting but it also allowed us to continue networking. The kind of connections that I made during that internship, and two previous volunteer sports internships I secured for myself prior to grad school, were critical in launching me into the field. I had entered the program with valuable experience (sold advertising and helped design a program for an NCAA regional basketball program in my hometown; worked in the New England Patriots' marketing department one summer), garnered academic knowledge through the on-campus professors, and topped it off with a "job" that introduced me to a 40+ hour work week in a high-profile field. I understand that the paid internship is no longer a requirement at O.U., but that is a reflection on the fact that the program is so much more widely established and acknowledged as a leading pipeline of talent in the field. Now, almost 80% of its students are offered jobs before they even graduate, and O.U. 's alumni network just keeps getting larger and more powerful. The master's program taught me that success takes more than simply acquiring academic knowledge. Curriculum is important, of course, but being able to research and synthesize information from multiple sources and then apply what you learned to real business situations and challenges is far more critical than book learning. Additionally, being able to communicate your thoughts, verbally and on paper, is more than half the battle. Writing skills are critical, even in a text-happy world where brevity rules. The courage to approach people face-to-face or by phone and ask questions is invaluable. The confidence of "presentation" or believing in yourself, knowing that you "belong" and that your thoughts are every bit as valid and valued as anyone else's — these things matter and are skills that can be learned and strengthened through the right academic approach. As someone who has specialized in communications throughout my career, the rapid change in the media universe — the ever-changing platforms and constant flow of information — is the biggest challenge I face. It's ironic but, as the volume and constant feed of accessible information has increased, communications pros have a lot more media outlets to work with (a real plus) but at the same time we are all inundated with more and more input through various channels, which often makes it harder to actually break through the clutter than it used to [be] (a real challenge). Telling the right story to the right audience at the right time has always been the name of the game, but now you have [to] keep track of a seemingly infinite number of burgeoning media platforms, figure out the right one for your client/message, and find the most efficient way to land a successful pitch. Earned media is no longer the be-all and end-all. Social media, owned media, and paid media are now equally important. And, while the overarching message needs to be the same for all these areas, the tools you use to deliver the content on each channel are different — and ever-changing. Even today's students, who grew up in a digital world where analytics are woven into everything in a way that simply didn't exist when I graduated, have to keep learning and staying on top of new developments and trends. Learning never stops, and successfully navigating a changing media and business environment will always be a challenge to anyone wanting to remain successful for the long term. How has your work in different sports leagues varied? Which sport have you enjoyed working in the most, and why? I've worked with a long roster of leagues, teams, sponsors, events, brands, and athletes in my career, and every one of them is different. Their starting points and goals are different, their cultures vary, there's a range of process and protocol, turnaround times, etc., so it's important to be flexible and know how to learn on the fly. Each time out requires a quick assessment of the landscape, identification of potential opportunities, solving [of] existing challenges, matching [of] objectives of different stakeholders to find common ground, and pinpointing the intersection of what the client wants as a message and what the media are interested in covering. It calls for learning about sports with which I wasn't previously familiar and finding, sometimes surprisingly, that it's a really great sport, which leaves me wondering why I didn't know that before — and happy that I get to help spread the word. The sheer variety keeps me on my toes, fosters creative thinking, and gives me something to look forward to every day. For me, personally, variety truly is the spice of life! It would be impossible for me to pick one particular sport as my favorite because each brings something different to my life. There are certainly special moments that stand out — riding with players in [a] World Series parade; sandboarding in the desert in Abu Dhabi with Tony Hawk and a number of Olympians as part of a PR stunt; creating social media content with rugby players (who are a lot of fun to hang with) from around the world to promote international matches; being on the field at a Super Bowl and feeling the intensity from the players — but I could never pick a favorite. How has the travel aspect of your work impacted your career satisfaction? Travelling in connection with sports has been incredibly rewarding — for several reasons. First and foremost, it often allowed me to visit parts of this country and the world I might not have otherwise gotten to see. And if there's a big sporting event going on, it typically means a city is going to show off its best side while you are there, so that's a bonus! Whenever possible, I try to book an extra day or two onto my business trips so I can go exploring on my own. Participating in sports events around the country and around the world also serves as a reminder of the power of sports to make people happy, to create passion, and to cross barriers. Sports are a great unifier, and feeling that as I travel recharges my soul. What advice would you give to students who are considering a master's degree in sports management? Students who are considering a master's degree in sports management should make sure to do their due diligence on the schools offering the degree. Search for a program that has a manageable class size so that you can get the personalized attention and conversation you need from the professors. Look for a program where the director and administration are committed to YOUR career development and job placement. Stay away from what I call "puppy mill" programs that offer a menu of general classes that can be applied to a degree and will earn you a piece of piece of paper, but that's as deep as they go. Make sure you are learning from the experts. Check out the rankings each year of SportsBusiness International's independent list of sports management offerings. Students also must know that working in sports isn't all glamor and fun. Yes, it's amazing to work for businesses that are in the spotlight, but know too that the hours are long and hard. Weekends and holidays are often not your own. When you are needed, you are needed. No ifs, ands, or buts. The off-season for the players doesn't mean it's off-season for you. Ask yourself if you are truly willing to make that kind of commitment. The best thing a student can do is to get involved with sports as a business BEFORE going to a sports ad program. See if it's something that interests, makes you curious to learn more, and makes you happy. If it does, then go ahead and apply! A sports management master's degree online program will vary from school to school. As you consider which program to enroll in, think about what concentrations the program offers, the program's curriculum, and the learning format of the program. These details will affect your career prospects and how quickly you'll be able to earn your degree. Event Management: Learn how to organize major sports events, from the development stage to day-of management. This course covers how to plan sport events, what factors affect an event's budget, and how to evaluate the success of an event. You'll also learn how to manage entertainers for a sports event and how to integrate a marketing plan into your event rollout. This course prepares you for a career as an event manager or planning coordinator for sports teams or facilities. Sport Finance: Study the intricacies of finance as it applies to the world of sports. You'll learn how to manage finances for players, teams, leagues, and sport facilities. You'll also examine the financial models used by sporting good manufacturers, college athletic outfits, and other sports-related businesses. This course is a good stepping stone for students with an accounting background who want to work in the finance department of major sports organizations. Sport Facility Management: How do you take care of huge stadiums, fields, arenas, and other major sport facilities? Learn how in this course. Sport facility management covers the basics of designing a well-thought-out facility, budgeting, and managing a facility's operations. You'll also learn how to market the events that take place at a facility. HOW LONG DOES IT TAKE TO GET AN ONLINE MASTER'S IN SPORTS MANAGEMENT? Typically, you can earn an online sports management master's degree in two years or less in programs that require you to complete 30 to 40 credit hours. The length of an online sports management master's program will depend on a number of factors, including whether the program requires an internship, whether it allows you to transfer credits from another institution, and whether it offers courses year round. Another factor that may influence how long it will take you to earn your online master's in sports management is whether or not your program follows a cohort model. In a cohort model, you will start your graduate program at a set time (like the fall semester) and work through the program at a predetermined pace with peers that started at the same time as you. By contrast, some online master's programs in sports management allow you to work through the program at your own pace, so you may be able to earn your credits quicker. Certified Sports Event Executive (CSEE): Sponsored by the National Association of Sports Commissions, a CSEE certification recognizes expertise and professionalism in the sports tourism industry. To earn the certification, professionals must complete curriculum developed by the NASC, which is offered live and online. Certified NFL Players Agent: To become a sports agent for an athlete in the NFL, you must be certified by the NFL Players Association. Certification requires a $2,500 fee, attendance at a two-day seminar, passing an exam and background check, and holding a graduate degree. A similar certification process is required to represent players in other sports leagues. As you explore your options for earning a master's in sports management online, be sure to narrow your list down to schools that are accredited. Accreditation indicates that a school has met certain standards and delivers a high quality education. Typically, a school is either nationally accredited or regionally accredited. National accreditation is usually reserved for institutions of higher learning that focus on a specific type of education, like distance learning or vocational training. Regional accreditation is given to an institution that has met the standards of a regionally accredited association. A degree from a regionally accredited institution is valid in any state. Schools offering a master's in sports management online are more likely to be regionally accredited. You may also want to look for sports management master's programs that have been accredited by the Commission on Sport Management Accreditation (CSMA). CSMA recognizes programs at the undergraduate and graduate level that provide excellence in sports management education. Accreditation associations work in tandem with other organizations to establish the standards that institutions of higher learning must meet. For example, the Department of Education (DOE) approves accreditors deemed reliable by the Secretary of Education. The DOE can only provide financial aid to students who attend accredited institutions. Another organization related to accreditation is the Council for Higher Education Accreditation (CHEA). The CHEA advocates for self-regulation among accredited institutions of higher learning to maintain high standards. Over 3,000 colleges and universities are members of the CHEA. To learn whether a school you're interested in is accredited, you can check the list of schools on the websites of the DOE and CHEA. According to the Bureau of Labor Statistics, the projected growth rate for jobs related to sports management is roughly on par with the projected 8% growth rate for all industries. Candidates with a master's degree stand to enjoy more favorable employment rates than other applicants who have ended their education with a bachelor's or less. Using BLS data, the following table includes the projected growth rates of four common career pathways for students who earn a master's in sports management. Current BLS data indicates that master's degree-holders face an average unemployment rate of 2.2%; by comparison, those with a bachelor’s degree face a 2.5% unemployment rate and those with an associate degree face a 3.5% unemployment rate. In addition to better job placement rates, students who earn an online master's in sports management also stand to increase their career earnings potential. The BLS notes that the median salary for master's degree-holders is $1,401 per week, compared to bachelor's degree recipients who earn a median weekly salary of $1,173. This amounts to a difference of more than $10,000 in annual salaries between the two groups. However, it's also important to note that the salary of a sports management professional will increase over the course of his or her career. Master's degree-holders often advance in their careers -- and raise their annual earnings -- at a faster rate than their counterparts with lesser credentials. The following table uses PayScale data to reveal the expected salaries for different sports management personnel at four career benchmarks. As the table indicates, employees in all four professions experience a significant salary increase during their careers. Assistant athletic directors saw the most growth -- 77% between the entry-level and late-career marks. The salaries for athletic directors (college/university) and athletic coaches also enjoyed 59% and 38% career earnings growth, respectively. PayScale also reports a median annual salary of $58,964 for sports agents at all career levels. Additionally, The Houston Chronicle notes that agents typically receive a commission based on the yearly earnings of each client, which include both player salaries and endorsements. The size of commissions will vary by sport; the National Football Association and National Basketball Association impose a 3% commission limit for agents, while major league baseball and hockey do not restrict commissions. The most successful agents earn millions of dollars per year in commission fees alone. Students who earn an online master's degree in sports management will qualify for dozens of positions after graduation, although individual eligibility will depend on their degree specialization and level of professional experience. Some of the most common career pathways for recipients of a master's in sports management are listed below. Administrative Services Managers: These managers oversee inventories, logistics, recordkeeping, and other supportive services of their organization. In the sports management industry, administrative services personnel typically handle matters like athletic equipment, away-game travel, and facilities management. Postsecondary Education Administrators: College athletic teams and departments are typically managed by postsecondary education administrators who specialize in student affairs. Their duties include scheduling games and practices, managing equipment, and handling internal team issues. Coaches and Scouts: Coaches lead athletic teams during practice sessions and games, and work with individual players to improve specific skills. Many teams are managed by a head coach with a supportive coaching staff. Scouts identify promising players who have not yet committed to a particular organization, and work with coaches to help recruit these candidates. Agents and Business Managers of Artists, Performers, and Athletes: Agents and business managers represent notable figures (including amateur and professional athletes) and promote them in the media. They also assist their clients with financial matters, such as contract negotiations and endorsement deals. Making professional connections and learning about different approaches to sports management is crucial to your success. Professional organizations offer a great entry point for students who want to learn more about their chosen career path. Below you'll find three of the country's most prominent organizations established for sports management professionals. These organizations host networking events, provide online trainings, maintain active job boards, and offer other services for career-ready college graduates. Resources like these often prove invaluable as you complete your degree requirements and prepare to enter the job market. World Association of Sports Management Founded in 2012 at the University of Taiwan, the WASM represents chapters on six continents (Antarctica is excluded). The organization follows a mission to "facilitate sport management research and teaching and learning excellence worldwide." North American Society for Sports Management: The North American offshoot of the WASM, the NASSM is dedicated to supporting, promoting and educating athletic managers in the United States, Canada, Mexico, Central America, and Caribbean countries. Members receive complimentary issues of the Journal of Sports Management and a discount on NASSM conference fees. National Alliance for Youth Sports: NAYS represents after-school athletic programs available to more than 30 million boys and girls in the United States. The organization often partners with other community-based youth agencies, including YMCA, YWCA, and Boys and Girls Clubs. Despite the relative affordability of online sports management master's programs, most students still need financial assistance. Students should complete a Free Application for Federal Student Aid (FAFSA) form to learn more about loans, grants, and other opportunities offered through the U.S. government. Additionally, private grants and scholarships are widely available through nonprofit organizations, companies, and other sources. Check out our collection of resources below to learn more about financial aid options.